Its time again for the Weekly Wedding Fix, and this week we have a pretty new header. I'm sorry I'm posting this a day late. I travelled over to Canterbury from Bath yesterday and got here all worn out so went for a 30 minute nap which turned into me waking up at almost 10pm having fallen asleep at around 7 :S Oops! 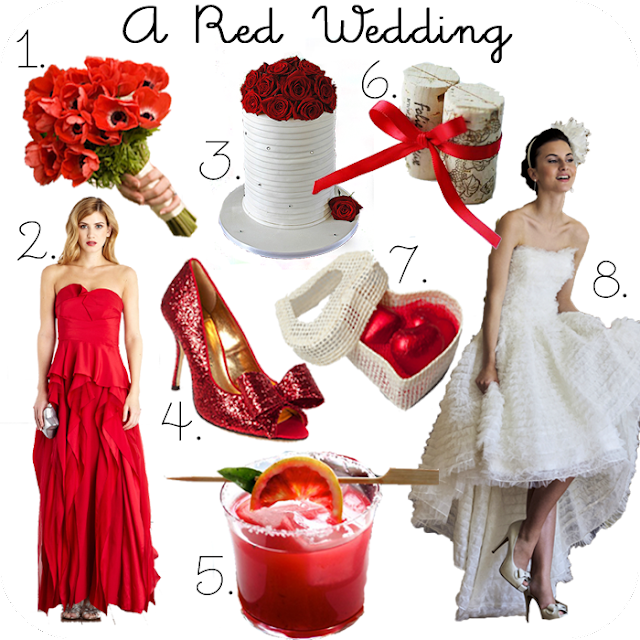 Anyways, this week I have put together a pretty red wedding theme for you. 1. The obvious choice for a red bouquet is romantic red roses, but I think that this poppy bouquet makes a beautiful, less predictable arrangement. The slightly softer colour and visual appearance of the poppies also makes it a perfect choice for a less formal wedding. 2. This red Coast dress is a rather expensive choice for bridesmaids but the colour, style and length are wonderful. I often feel that full length bridesmaid dresses look a little too formal but the ruffles and edgy sweetheart style neckline counteract this and make it a beautiful and stylish choice. 3. This stylish cake offers an alternative to the traditional tiered cake decorated with royal icing and ribbons. Using small gemstones to add decoration to the cake is a lovely idea but you must remember that whoever is in charge of distributing the cake is aware that they are not edible and must be removed before being served. Alternatively, you could use edible silver balls to stud the cake and avoid the issue of removal afterwards. 4. I spotted these shoes at the weekend in Ted Baker and instantly fell in love. The photo does them no justice, they really are breathtaking. They are the perfect way to add a little glitz to your outfit. Think how lovely they would look amongst the white or ivy of a wedding dress for a fun and edgy alternative. 5. This eye catching cocktail is a Blood Orange Margarita. The beautiful red colour comes from the orange and would look wonderful against white table linen and crockery. The recipe is incredibly simple and sounds totally delicious. 6. With a red theme, it is very easy to go over the top when decorating tables. Instead of going all out and using red tablecloths, glassware, crockery and napkins and giving a complete over kill. Instead keep it light and use all white and just use a simple red floral arrangement as a centre piece and add small injections of colour such as a red napkin ring or red place settings. This cork name holder uses a simple red ribbon to add colour. 7. These sweet little heart shaped boxes filled with red chocolate treats will look beautiful on the table and also use the idea of just using very small amounts of the theme colour to create a light and pretty look. 8. Last but not least, is this beautiful wedding gown from Ian Stuart, my very favourite wedding dress designer. The Swan Lake inspired gown boasts layers of delicate tulle frills and graduates from a knee length skirt into a floor length train at the back. I think the soft, slightly unusual look of this gown works perfectly with this theme. I hope you like this week's red theme, I had great fun putting it together, and I'm very sorry it's up a day later than planned. PS. Today is the last day to enter my first giveaway and win some pretty handmade gifts as well as a bonus secret beauty prize. I love the theme today. :) Although anyone who is supersitious needs to know that red and white at a wedding is bad luck - my great grandmother always said it signified 'Blood and Bandages'.